Over the next several months, we will be updating this new encoder regularly and introducing additional features, such as additional file format/codec support, thumbnail support, ability to trim a live archive Asset, and much more. Over time, the new "Media Encoder Standard" will replace "Azure Media Encoder". Consequently, this new encoder has the same pricing as Azure Media Encoder (see the column labeled ENCODING here). 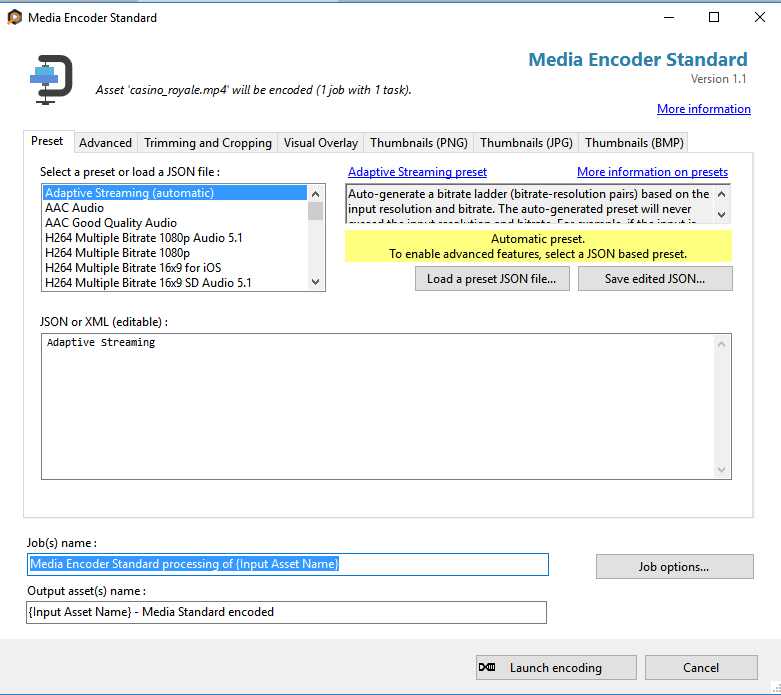 In this blog post, I will introduce the capabilities of the initial release of Media Encoder Standard, and provide a quick example for using it. Please visit our documentation center to learn more details about how to use this encoder. Transcoding a variety of source formats into multiple GOP-aligned H.264 video streams, and AAC audio, packaged into ISO MP4 containers. The result can subsequently be streamed via Dynamic Packaging. Click on “Launch encoding” to submit your encode Task. You can refer to this blog for descriptions on how to publish the output Asset, and stream it to a browser. Note: Additional encoding presets, and detailed description of them, are available here.